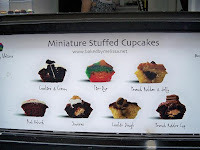 While in Soho yesterday, my brother Peter and I noticed a cute cupcake take-out counter called Baked by Melissa. We were immediately drawn to it, as the cupcakes were adorably small and featured seven interesting flavors: cookie dough, red velvet, cookies & cream, s'mores, peanut butter & jelly, peanut butter cup and tie-dye. They were all so cute and looked so yummy that we got a box of six, omitting only the tie-dye--it looked too artificial and I wasn't curious about what tie-dye flavor would taste like. Peter and I had two cupcakes each, and the remainder we shared with Dan and Peter's girlfriend, Fiana. We were all impressed, especially with how much bank you get for your buck. Even though the cupcakes were tiny, they offered the perfect amount of flavor to give you that sweet fix. The frosting was very delicious and plentiful, making them feel more substantial than they actually were. The dough was lovely--soft, moist, sweet, and I'd go as far as to say that it was on par with Crumbs. These teensy treasures come at a premium, but they're worth every penny. The quality is excellent and you get what pay for--delicious, luxurious mini cupcakes without all the guilt. After 100, each additional cupcake is $.70. Tax is included in all pricing. Is that pricing right? It sounds like you pay more the more you get?? Yep pricing is right - see clarification on the single quantity. Sorry you felt that way Anon - I do not agree. I actually had these cupcakes tonight with three other girlfriends and everyone loved them. The dough was moist, the frosting was flavorful and full of surprises - overall, two thumbs up. I'd encourage you to give it another try.